This past Saturday was Evanston's second farmers market of the season. Sadly, I wasn't able to make it to opening day but I made up for it this week by buying extra stuff. (wink) I really love the market on a spring morning when there is still a chill in the air. Each farmer had a small selection of vegetables but everything looked wonderful and full of promise. There were lots of greens and many varieties of spring onions and radishes, but no strawberries yet. Everyone had some asparagus and herbs. You can't help but be inspired to cook a spring dish. 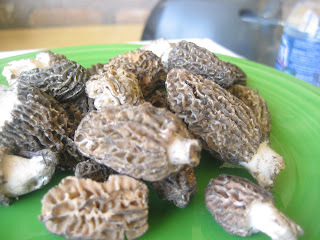 The most exciting find of the day was definitely these morel mushrooms. They were priced at 44.99/lb. But I bought $6 worth and it was enough for two small portions. 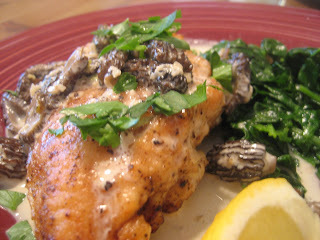 We used them to make a chicken with morel cream sauce and served it with some organic leaf spinach (so fresh, like they have just pulled it out of the ground) sauteed with garlic. 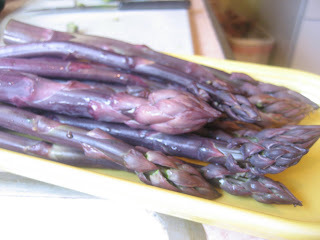 I also got these fat purple asparagus, and some french breakfast radishes. There were also some sweet young chioggia beets with really fresh green tops that I couldn't pass up. As soon as I got home, I cut off those tops and put them in a vase of water. I need to see what Deborah Madison thinks I should do with them. I guess I'll be browsing her books this evening. 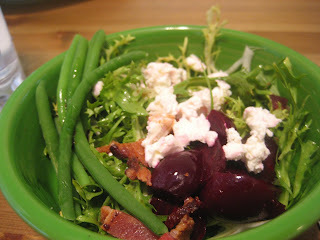 As for the beets themselves, they got roasted, peeled, and then served in a salad of frisee, bacon, goat cheese and a tart vinaigrette. We ate this salad with some steaks on Memorial Day. They were so good that I think I will buy more if they have them next week. What I (i.e, my waistline) can't afford is another cream sauce, so I'll have to do some sort of saute. Man, you're eating well! 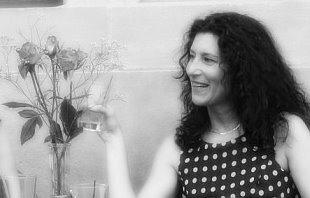 Why don't we have morels at our market? Waaah.